Nexus ponders gods, stands with kings, and faces the ghosts of his past in the incredible adventures that introduced Nexus to a new generation! 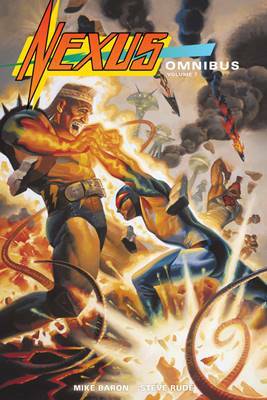 Created by Mike Baron and Steve Rude, Nexus is a superhero/science-fiction masterpiece! This value-priced omnibus collects Nexus: The Wages of Sin #1-4, Nexus: Executioner's Song #1-4, Nexus: God Con #1-2, Nexus: Nightmare in Blue #1-4, and Nexus meets MadMan!